Seeds of Change - Heiner Benking's Blog - quergeist.info: FUTURES ready now? Weekend in Berlin? FUTURES ready now? Weekend in Berlin? Collegues, this is the second time in 400 blog entries that I make a pre-announcement, partially as we might also like to hang-out before or after Saturday. Some friends wanted to come and their might be still a seat available at Philip Horvaths event on Saturday. 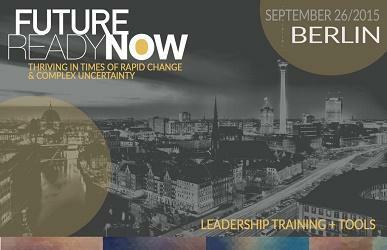 A GLOBAL COMMUNITY OF FUTURE-READY LEADERS meeting next weekend in Berlin ! * Deconstruct old mental models, so that they can see the present clearly and open to a future of possibility. * Feel empowered to create the future. * Integrate information from disparate sources so that they can stay on top of what is important. * Practice using a scalable innovation process, not just a new thinking tool for managing rapid evolution. * Confidence to lead their team in creating a new future, now. * Connection to a global community of powerful peers.